The cell phone connection, these being cosmic and pure, only made scratchy and difficult by the devices, modern versions of the tin can and string, wasn’t good*. I was in my work van, cruising south on Surf Route 101. I had made three phone calls to Stephen, left one message, left the other two before I would have had to. “Missed” calls. Steve was, evidently, on a break, just outside of the kitchen at a restaurant at Fort Warden. Okay, it was either a challenge or a statement (I’ll say ‘statement’ rather than ‘put-down’) that I was not up to the task. That may be true. Setting aside my age, I haven’t taken a lot of time to explore the wild coastline, take the logging roads, walk paths along bluffs and cliffs, but I do know there are several (there just have to be) spots where, on some particular swells, under some conditions, waves follow the rugged points, peel into log-jammed beaches. And, Stephen had sent me some photos from an earlier trip; a shot of a random, unnamed and probably-never-surfed slab, which I posted on this site, and a photo of the spot he and Stig had so recently ridden, taken from a high cliff; spooky, congested inshore on a rocky ledge, and scary-if-enticing lines peeling to a certain closeout section. I didn’t post it, on Stephen’s quite-adamant insistence. He and the surfer with him on that quest, and others they met on site, also declined the opportunity. Stephen did send photos from this session, when he and Stig got there before the south Devil wind came up, chop blowing into the wash-throughs, the sneaker sets hitting unknown outside reefs. From the beach, from the photos, it looked, to me… possible. But, you won’t see those photos here. Oh, the photo above is of somewhere, somewhere else, borrowed from nwframeofmind. *Someone told me the cosmic string theory. I just said, “Uh huh.” **I actually saw super 8 movies of this very spot over thirty years ago. When I said, “It looks like Swamis,” I was booed, corrected, and, most tellingly, not invited to the next private surf movie night. 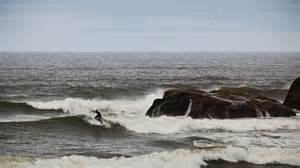 Probably my second thought on hearing the challenge/realistic assessment from my friend, was that it would make a great short story; old(er) guy takes on surf spot, does or doesn’t get a few great rides, does or doesn’t drown. Really, my biggest fear is getting back up those cliffs after, after what? Meanwhile, Stephen is working on his own surf-centric story that he will, he says, allow me to publish to the pure dark cosmic internet. This entry was tagged secret surf spots, surf sessions, surf stories, surfer Stephen Davis, surfing the Washington coast, Swamis. Bookmark the permalink.